At Bellbowrie Family Medical Practice, we are pleased to offer pre employment testing in line with legal and industry requirements. The purpose of a pre employment medical exam is to determine if you meet health and fitness standards required by law or by your industry. We are happy to apply our medical skills and knowledge to help employers reduce the risks in their workplace and take responsibility for their duty of care. Contact us today to discuss the pre employment testing we have available for your industry. What is a Pre Employment Medical Exam? The pre employment medical test is designed to assess your current health and fitness standards. These standards are in place to ensure that you are safe, fit and capable of safely undertaking your duties. All testing undertaken is specifically relevant to your job and your role’s unique requirements rather than the general state of your health. Once the results of the test are available, you can expect your employer to advise you of the test’s outcome and will treat the information with strict confidentiality. What Checks Are Included in a Pre Employment Medical Examination? Contact us by phone or email if you would like to learn more about the testing required for your industry before your appointment. At Bellbowrie Family Medical Practice, we are able to perform all types of pre employment medical examinations, routine assessments and exit medicals when you leave a position. While pre employment medical assessments are a recommended workforce risk management tool for many businesses, some high-risk industries are legally required to conduct specific medical checks on their employees. Avoid loud noise (including loud music) in the 24 hours before your test as it can affect your audiometry results. If you are having a urine test, don’t drink more than 2 cups of water beforehand. Too much water can dilute your sample, and you will be required to submit another one. Avoid using cannabis and other drugs before the test as they can remain in your body for days or weeks after use. Declare any prescription medication on your health assessment form. Avoid smoking before a spirometry test as this could affect the results. Wear appropriate underwear in case your GP asks you to remove your outer clothing for the examination. Be honest about any past health issues. This is in everyone’s best interests and won’t necessarily cause you to fail the examination. If you are undertaking a work fitness assessment, wear comfortable clothing and closed shoes (joggers). You should allow one to two hours for the examination, depending on the specific checks required. You will also be required to bring your driver’s licence or another form of photo identification along to your appointment for the pre employment medical exam to take place. If you have to provide a urine sample, we are legally required to witness the collection of the sample. We understand that this can be uncomfortable, so we will be respectful in regards to your privacy. Our GP will examine your joints, spine, neck, chest and abdomen. You will also have your heart, blood pressure and pulse checked. You might be asked to undress down to your underwear as part of the physical examination. 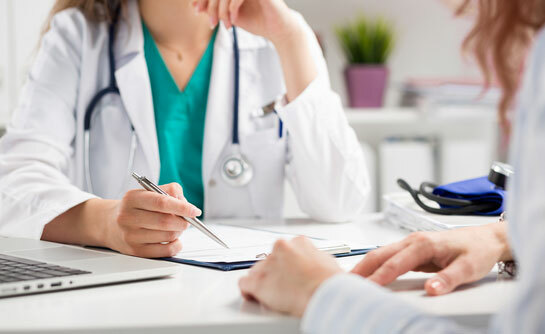 At Bellbowrie Family Medical Practice, we are pleased to offer a comprehensive range of pre employment medical checks and we do everything we can to make you feel comfortable throughout the pre employment testing process. If you would like to know more about our pre employment medical test, or if you would like to schedule your appointment, call our friendly team on (07) 3202 5360.